Major new reports from the World Meteorological Organisation (WMO), theInternational Energy Agency (IEA) and GermanWatch have turned up the heat on negotiators holding back progress at UN climate talks in Warsaw. 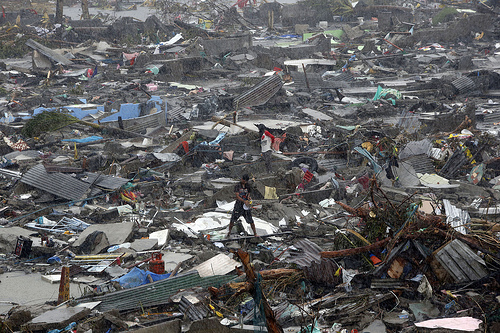 These reports provide fresh information explaining how Typhoon Haiyan was more deadly as a result of climate change and how climate extremes – while prevalent worldwide – are hitting vulnerable communities hardest. These new findings leave little doubt that global warming emissions are on the rise and that governments must take urgent, concrete action to curb climate pollution from the energy sector – in order to prevent a catastrophic temperature rise of up to 6C this century. According to the WMO climate change is already disrupting the water-cycle leading to droughts, floods and extreme rainfall in countries around the world, while others warn that the most vulnerable nations like Haiti, Pakistan and the Philippines are hardest hit.The WMO report highlights that so far in 2013 we have experienced climate extremes from record heatwaves in Australia to flooding in Sudan, USA and Europe. A complementary study from GermanWatch analyses national exposure to climate extremes from the present back to 1993, it shows us that it is the communities least able to protect themselves and most vulnerable to natural disasters that are being affected most by climate impacts.